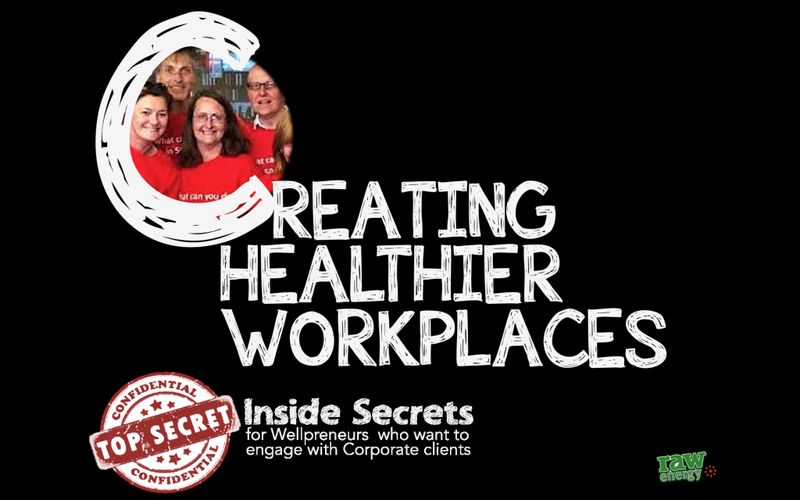 CREATING HEALTHIER WORKPLACES: My Top 11 Secrets to help you successfully engage with Corporate clients and grow your impact and business in the process. Corporates are essentially communities of people who work together towards a common goal. They provide a great opportunity to share and help a lot of people to create healthy lifestyle habits, and support each other through change. They can’t do this on their own, though, and need the help of health coaches, massage therapists, nutritionists, reflexologists, and other ‘wellpreneurs’ to tackle the issues that are so prevalent in corporate environments: high psychological stress, a dependence on processed foods & caffeine, too much sitting and more, which are collectively contributing to weight gain, low energy, back pain, depression, diabetes and all of the societal issues you’re so very aware of. In 2014, an idea of creating a more holistic corporate wellbeing programme was born at RBI, the company where I led the marketing function for 9 years. It quickly engaged and captured the attention of the 3,000 employees working in different roles across the world. In 2016, the RBI Living Well programme was externally recognised by winning the CIPD award for Best Health & Wellness initiative. Running this programme from the inside taught me so much. We certainly didn’t get everything right, but it helped me appreciate the key role that corporates can play to educate and support their employees to create healthier workplaces, healthier communities and healthier individuals, creating a successful business and a better world in the process. Corporates need your help and that’s why I have summarised my learning and created the INSIDE SECRETS to help you successfully engage with corporates and have a greater impact. Complete the form to the right of this page to get instant FREE access.